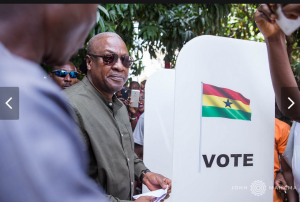 Former President John Dramani Mahama has won the presidential primary per results available to rainbowradioonline.com. His victory was a landslide as he polled an overwhelming 213,443 votes representing 95.24% of the total valid votes cast. His other six contenders were only able to poll about 4%. The Second Deputy Speaker and Member of Parliament for Nadowli/Kaleo, Mr Alban Kingsford Sumani Bagbin, polled 2313 votes representing 1.032% of the total votes cast with Ekwow Spio Garbrah getting 1457 votes which represents 0.650% of the total votes. Former Vice-Chancellor of University of Professional Studies; Accra (UPSA), Prof. Joshua Alabi followed with 3,399 votes representing 1.516% of the total valid votes cast. Former Chief Executive Officer (CEO) of the National Health Insurance Authority (NHIA), Mr Sylvester Mensah and businessman, Goosie Tanoh had 932 and 2038 votes respectively representing 0.415% and 0.909% accordingly. Nurudeen Iddrisu, a business man, came last with just 519 votes representing 0.231%. About 224,101 delegates took part in the election representing over 99.20% of the turnout.